I know, I know. When tomatoes are the freshest they ever are, who would make soup out of them? Me, that’s who. Don’t get me wrong, I love salsas and gazpachos and panzanellas and capreses just as much as the next tomato lover, but there is something deeply satisfying about making soup out of a beautiful bounty of tomatoes of many varieties. It is sort of like distilling the summer down into a pure essence. A little cream just enhances the flavor and helps you transition to the cooler months. With the right equipment, this is a super simple recipe – the special items you’ll need are a good blender and a fine mesh strainer. Preheat your oven to 475°. Find the largest baking sheet you own. Envision that baking sheet when you go out to your garden or to the local farmers market and get as many tomatoes as you think will fit onto the sheet. To make a half recipe, you can cut each tomato into halves or quarters to fill the baking sheet (see my pic). Once you have them situated on the sheet, drizzle with a few tablespoons of olive oil (just enough to give them a sheen) and season with salt and freshly ground black (or white) pepper. Tuck a few sprigs of thyme, basil, oregano, or tarragon (super summery! 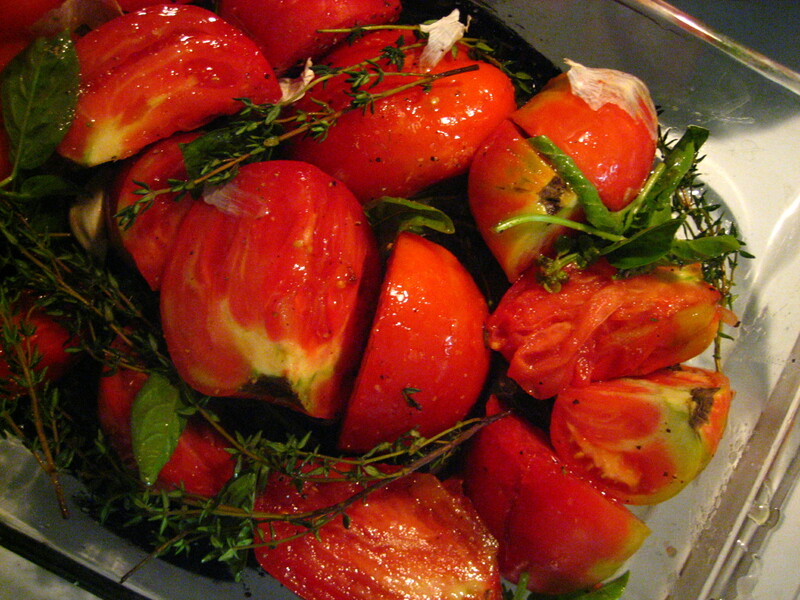 )—a combination of herbs works best—in between the tomatoes and scatter 7-10 cloves of skin-on garlic over them, as well. Place the whole tray into the oven and roast on high for 10-20 minutes, cooking with your nose during this time; if you start to smell burnt tomatoes, turn the oven down before you get to 20 minutes. You want some roasted flavor, but not a burnt mess. If the tomatoes can withstand the high heat, then give them a full 20 minutes before you turn the oven to 250º for 45 minutes to an hour. After the slow roasting period, the blender and the mesh strainer come into play, in that order. Once the tomatoes cool a bit, pull the stems of the herbs out from amongst them, as well as the garlic cloves, which should be soft enough that you can just squeeze the garlic out of the skins and into the blender. Add the tomatoes to the blender in batches, being careful when pureeing them (they’ll still be quite hot). I always put the lid on and then hold a clean towel over the top to prevent any accidents. Blend the garlic, tomatoes, and herbs until they are a smooth puree, then strain them into a soup pot big enough to hold them and still have room for a little more liquid (straining will remove any seeds or skins). Depending on how “comforting” you want your soup to be, you can add a half to full cup of half and half, light cream, or heavy cream once you bring the puree back to a simmer (the amount of dairy should be just enough to change the color from red to pink). Stir, taste for seasoning, and ladle into bowls or mugs. 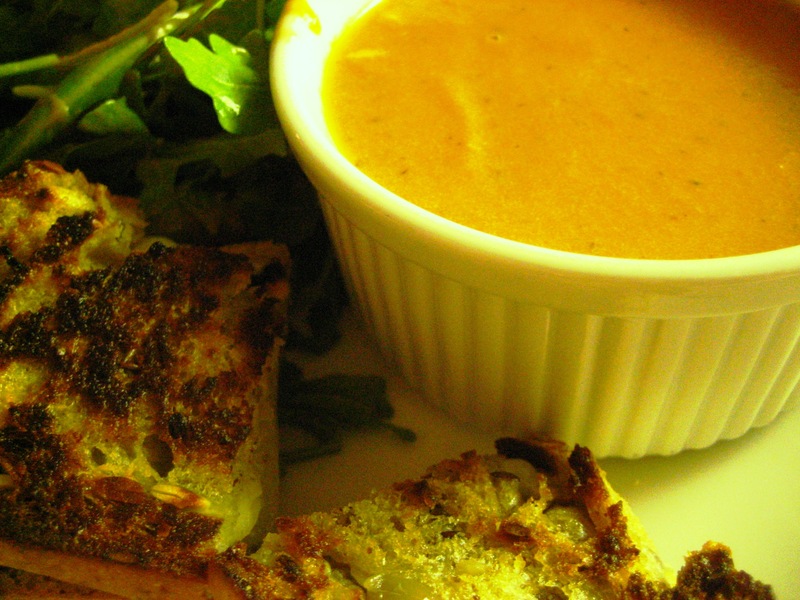 Serve with grilled cheese sandwiches, of course.